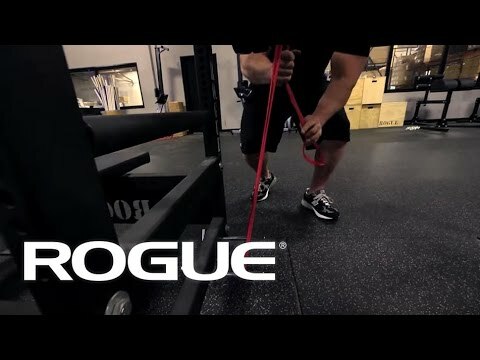 Available to order individually, in pairs, or as part of a full set, Rogue Monster Bands are the versatile, go-anywhere accessory for customized resistance training—from mobility work and pull-up assistance to banded squats and bench presses. There are (8) color-coded versions of the natural latex rubber stretch bands to choose from, each measuring 41" in length, but varying in width, thickness, and overall resistance. This makes each band more specialized for certain types of training. Add portablility and versatility to your Monster Band routine with the Rogue Door Strap. The thinnest, lower-resistance Monster Bands are best for pull-up assistance, general conditioning, rehabilitation, jumping, speed training, and beginner / light weight training. Mini bands can safely raise the intensity of a weightlifting movement without adding additional weights to a bar. For the stronger lifter, they will also add considerable resistance to bicep and tricep exercises. 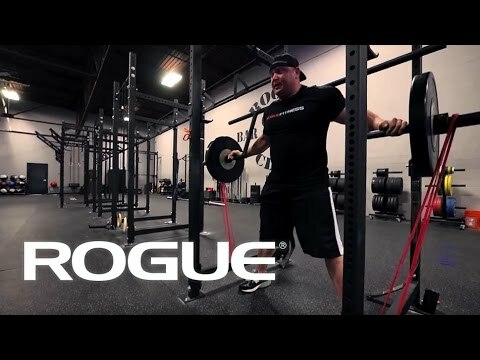 These mid-level bands can be used by stronger benchers, as well as for banded squats and other exercises involving the lower body, calves, quads, hamstrings, and glutes. Our green and black Monster Bands are also good options for mobility and stretching. Our highest resistance bands are used for obtaining maximum resistance with squats, deadlifts, leg presses, and shrugs. These are recommended for experienced, high-performance athletes. Monster Bands are lightweight, no-nonsense additions to your prehab/rehab/recovery regimen. They fit easily in a gym bag pocket, make good complements to other essential mobility tools like our Rogue HD Foam Rollers and MobilityWOD Supernova, and can be used for indoor or outdoor training like our Rogue Wood Gym Rings and SR-1 Speed Rope. Rogue Monster Bands is rated 4.9 out of 5 by 213. Rated 5 out of 5 by Happywife from Excellent investment My husband used his set for the first time this morning after having grown out of a competitor’s set and needing something more substantial - your bands are huge, strong, great quality, and he loves them and hasn’t stopped talking about them all day. I’m enjoying the puffed up post-workout muscles and look forward to seeing the results. He’s going to have DOMS tomorrow for sure and I’ll probably need to start feeding him even more. Thanks for the great product. Rated 5 out of 5 by Mrbelvedere3 from Perfect purchase Are use this band every single day to help with my muscle ups. So awesome! 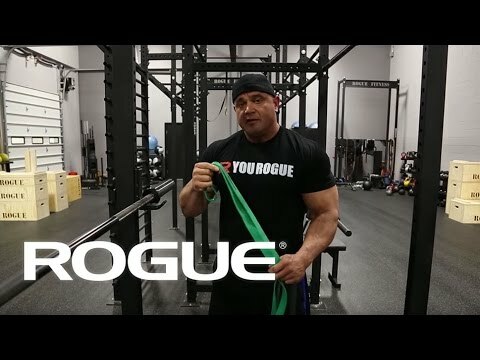 Rated 5 out of 5 by JasonBuberel from Best bands in the industry I've gone through several different sets of bands from other manufacturers, and I always come back to my Rogue bands in the end. They're the most durable, and if you have a complete set, offer an amazing range of resistances for band-based workouts. I can go from lateral shoulder raises (orange band) to deadlifts (purple/red) with this set. Very versatile. Rated 5 out of 5 by Ronseyer84 from High quality, tough, and versatile bands I bought a set of the red (2), blue (2), and green (1) of bands. There’s many uses to these bands ranging from stretching to pull-up assistance. Definitely recommend these to those who need to work on form and getting some more reps in with the pull-up. Great product! Rated 5 out of 5 by ericmannlifts from So far so good! After doing lots of research and consulting with my coach I purchased these bands because of their long term quality expectation.So far I've only used the smaller sizes but really like the quality. Rated 5 out of 5 by Sssw from Great fitness banda Love the bands, bought them to use for exercising while travelling. Sturdy and really good bands.